University of Waterloo student delegates at COP23 demonstrating against the rising seas due to climate change. Photo courtesy Steven Jia. Thanks to support from the University of Waterloo, myself and 10 other students were able to attend the annual UN climate change conference in November. COP23 took place in Bonn, Germany and was hosted by Fiji. 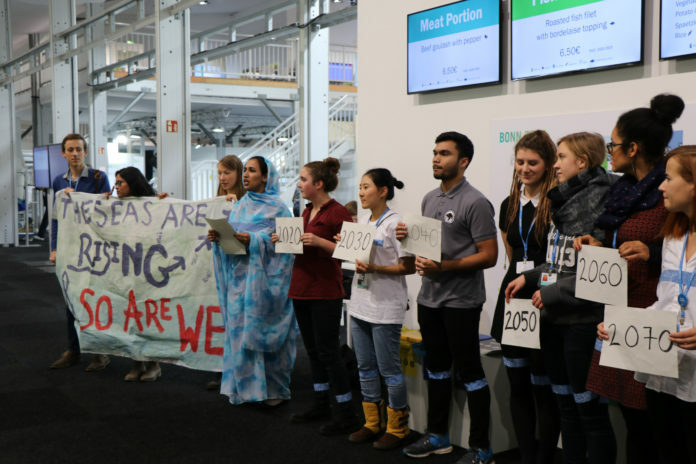 Going to COP23 was a chance for us to see what happens on the international stage when politicians come together to negotiate, and civil society groups meet to exchange ideas. After 2015’s historic Paris Agreement was signed, governments have been busy figuring out how to implement it. And this doesn’t just mean curbing greenhouse gas emissions. Recent extreme disasters, including hurricanes in the Caribbean and floods in southeast Asia, are stark reminders of the “new normal” that lies ahead if we don’t support adaptation. Not all parts of the world are going to experience climate change the same way. Those that will suffer the most are areas that are already vulnerable and struggling with poverty. Fortunately, there are hundreds of amazing NGOs and civil society groups that we got to learn about while at the conference. I had the opportunity to sit in on the Women and Gender Constituency during the week. They’ve been around since 2009, advocating for women’s rights to be part of the UN discussions on climate action. There are eight other constituencies too, ranging from farmers, researchers, youth, Indigenous peoples, and more. Through hard work and advocacy, civil society groups have been pushing for climate justice. This year’s COP saw the adoption of a Gender Action Plan and the Local Communities and Indigenous Peoples’ Platform during the negotiations. It’s an important step forward for marginalized peoples around the world. All countries, Canada included, need to step up their game. Being at COP23 was a reminder that we need stronger policies implemented sooner rather than later. Arguably, developed countries need to take more responsibility for the damaging effects of climate change already being experienced in vulnerable areas. So what can we do as students? It starts at home. Talk about climate change with your friends and family. Take action by changing your daily habits and getting involved in the community. Finally, demand better from your municipal, provincial, and federal government. The future depends on it. Pan Am games this summer, Rio next?